One of the fun parts about the blog is seeing people from all over the world visit the site looking for information on the Dearlove family. Some are looking for specific people, some are looking for genealogical information, and a few others are looking for information on two Mark Dearloves, instrument makers in Leeds during the first part of the 19th century. Music is a thread that runs throughout the Dearlove family, whether they be direct relations or long-lost branches of the family tree. I first became aware of the Dearlove instrument makers from a member of the orchestra I used to manage. One of the violinists was shopping for a new instrument, and she stopped me in the hall one morning to say she’d tried out a Dearlove violin and wondered if I knew anything about its history. I was clueless, but intrigued. I can barely hang a picture, so the thought that someone sharing my surname would be skilled enough to build an actual violin was stunning. To date I haven’t seen a Dearlove violin or cello, although I do receive an e-mail from time to time from musicians who have picked one up and are looking for information on its origin. The comments thread on the post A Little Dearlove History includes some of these queries, and Carl Applebaum, a luthier who runs the Applebaum Violin Shop in Tacoma, Washington, has provided some helpful information. Here’s a bit of background he provided recently on the two Mark Dearloves. Very little solid documentation exists about the instruments made by either father or son. It does seem clear that the son hired at least two other violin makers to work for him, so it is difficult to credit instruments to him personally. Mark Dearlove died in 1820. His wife, Mary, operated the shop for a few years, until their son, Mark William, came to his majority. The cello I have is on a sort of Amati pattern, but quite wide and short in the body, with measurements similar to a Montagnana (although it seems unlikely that Mark Dearlove was aware of Montagnana’s work). The f’s are quite vertical, and a little far apart, reflecting the width of the body. In these ways and others, they are typical of many English cellos of the late 1700′s and the early 1800′s. This cello must be from the decade between 1809, when Mark opened the shop in Boare Lane, and 1820, when his death notice appeared in the local newspaper. It reflects a style of workmanship that was superseded later by a more polished approach. 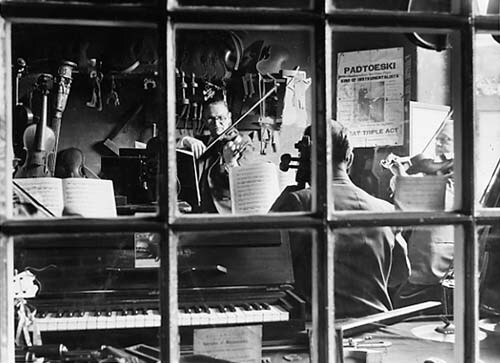 As for the style or level of workmanship of the son (or his workmen), the few photographs available in the reference books, and the two cellos held by the Abbey House museum in Leeds, seem to show that he adopted a more Stradivarian model, as did most of the British makers during the mid-nineteenth century. You should also be aware that there were quite a few other violin makers in Leeds and its environs. The mere presence of “fecit Leeds” does not in itself indicate a Dearlove origin. For those interested, I just finished the work on the cello restoration two days ago. It sounds quite warm and powerful; but I still need to spend some time adjusting it as it “plays in”. If anyone has a Dearlove instrument, please feel free to leave a comment below – I’d love to know which part of the world you’re from, how you came to acquire it, and any other details you’d like to share. i own a dearlove violin that originally belonged to my dad. i learnt the violin for many years and it has made the long journey from the UK to new zealand where my husband, i, and our two little girls now live. if you’d like any more detail please let me know. My grandfather was Jack Dearlove (Sec of Musicians Union UK), and I grew up with him very aware of strings being very important to every member of our family, before he died , I worked on our family tree with him and I have a picture on my wall now of all the members of our family in the early 20th century playing instruments. My son is now a chorister at a major Cathedral and plays instruments himself. I would love to find a dearlove instrument for him one day. I too am a descendant of the Dearloves. My grandfather was Alfred Boshell Dearlove, a cornet player based in Harrogate but born in Leeds. I took up cornet late in life and still play tenor horn in a local brass band in Harrogate. I own a Dearlove cello which I bought in London in the early 2000’s. Its a beautiful instrument in looks and tone. It was the first one I played in the shop and any others played after paled in every way. I play for pleasure but hope to one day to return to playing in an orchestra. I used to play with the Jersey symphony orchestra. I now live in Kent, UK. I own a cello built by Mark Dearlove. My teacher brought it from San Francisco. For a wonderful instrument, I got it for a really good price. It is the most valuable item I possess. It’s gorgeous, can’t choose a better word for it. This instrument suits me really well and it’s perfect for me. This cello will probably be lifetime lasting instrument I’ll be using. I’m a Korean cellist, and I live in Japan. David. Thanks for posting your comment. The family are widely scattered now and I am not aware of any Dearlove instruments in family hands, but it is interesting to hear of any news on them. I believe they were considered good quality instruments in their day. Perhaps you are aware of the replica Dearlove music shop in the Kirkstall Abbey museum in Leeds? (I assume it is still there – I haven’t been for a good many years). Hi! As Dearloves tend to be musically inclined I felt I should share this. My branch, including myself, tends to take a shining to brass. Although piano plays a role in our family, brass is where a lot of talent resides. I thought it interesting. My father just returned from South Korea actually, his drum corps was invited to play there. Also, is there perhaps a picture of a Deadline violin out there? I live 15 miles from Leeds where Mark Dearlove had his violin making business, and my mother was a direct descendant of him. Her father, Alfred, my grandfather was a brass player, cornet, but most of his brothers, father, grandfather and cousins were string players and played in various groups around Harrogate up to the time of WW1. I am a brass player in an ameteur way. I may have a photograph somewhere in my family records of a Dearlove violin and will have a search. I do have photographs from a magazine of part of a set of miniature stringed instruments made by Mark. I own a Dearlove cello from about 1830. I bought it in the late 1990s in Croydon from a dealer called Paul Weaver, who bought it from an auction.It has had a lot of restoration work done on it and I have to have some cracks regularly maintained. I perform on it all the time. It is a lovely instrument. I live in Ironbridge in Shropshire and regularly it play at gigs. After having owned it and played professionally on it, for over 25 years, I am, reluctantly, selling my Dearlove cello- just put it up for sale today… just in case anyone is interested! I have owned a Dearlove cello for 60 years.My father bought it for me when I was 16 from the Boar Lane shop in Leeds. I played it through my time at the RCM and subsequently for teaching and orchestra, and chamber music playing. It has been sensitively maintained by Paddy at Hibernian Violins in Malvern and I go on enjoying it in retirement.